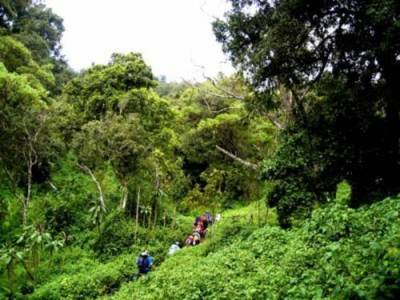 The best hikes and treks in Africa are listed below. Challenging peaks can be found from Morocco's Atlas Mountains all the way down to South Africa's Drakensberg. Africa's most popular trekking destination is Mount Kilimanjaro, the highest mountain on the continent. Lesser known ranges like Uganda's Rwenzori Mountains offer an incredible array of snow-capped peaks right next to the equator. "Kilimanjaro summit view from Shira camp"© Erika Bloom. Routes vary in degree of difficulty, traffic and scenic beauty. The least difficult routes are Marangu and Rongai; the more difficult routes are Machame, Shira and Limosho. The longer routes have more difficult hiking but you'll be more acclimatized and your chances of reaching the summit are therefore higher. An average trek will cost from $2500-$5000 per person. Mount Kilimanjaro in Tanzania stands at 19,340 feet (5895 m) and is Africa's tallest mountain. The attraction of hiking up Mount Kilimanjaro is that it's not a technical climb so no equipment such as oxygen and ropes are necessary. But it's no walk in the park, trekkers make their way through 5 climatic zones before reaching the summit. Weather changes from moment to moment and the high altitude wreaks havoc on the body and mind. 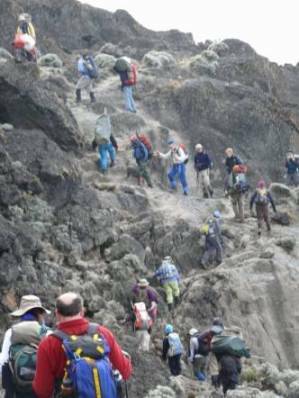 The photos below are from a trek made in Dec - January 2007/8 using the Lemosho-Barranco-Barafu Route. 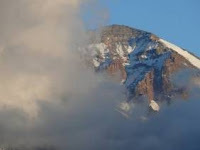 This is a 7 night, 8 day trek and allows enough time for acclimatization to the high altitudes -- critical for a successful ascent of Kilimanjaro. Erika Bloom (the photographer) was a volunteer trip leader for the Appalachian Mountain Club (AMC) and co-leader on this trip and now runs Serengeti Pride Safaris based in Tanzania.